One Gin - Sage & Apple, Tasting, Wedding inspiration. YAY! It’s that time again… time to get you ginspired with a review on One Gin – Sage & Apple. A smooth, aromatic spirit rich with the scents and flavours of juniper, orchard-fresh russet apple and fresh, aromatic English sage. This gin is infused with a wide selection of botanicals including; Juniper, Angelica Root, Cassia Bark, Coriander Seed, Liquorice Root, Nutmeg, Orris Root, Lemon Peel, Sweet Orange Peel, Bitter Orange Peel, Fresh Sage, Russet Apple. Firstly this Gin smells absolutely phenomenal, even popping the cork off the bottle you instantly get hit with so many fruity flavours. Every time I go back for a sip the smell is just amazing. I paired this gin with a crisp Indian tonic as recommended by The Craft Gin Club. I personally didn’t like the tonic, which I think does let the gin down a bit. On first sip, it’s fruity, but also quite bitter. I decided to mix the flavours up a bit and added some freshly sliced strawberries to my cocktail. This definitely helped to bring out the sweeter tones of the gin. I think our good old friend ‘Fever Tree’ could have saved the day, making me enjoy my drink a lot more, but that’s just a personal preference. There are a few things that claw back some all important points in Rosie’s Ratings. One is that 10% of all profits go towards water projects in the worlds poorest communities! This is a lovely way to turn something indulgent into something charitable & heartfelt. 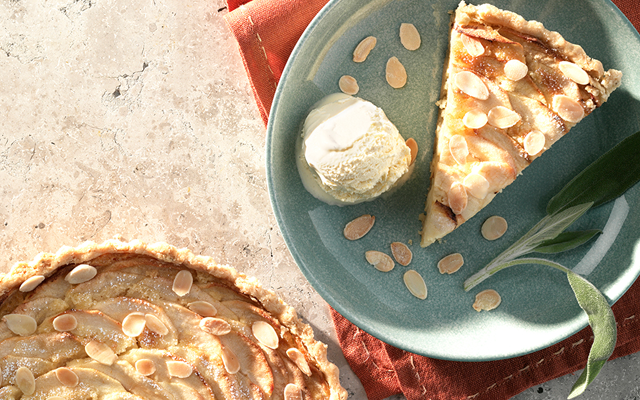 And the second thing is that I just found this incredible recipe for gin-soaked, apple & almond tart! Gahhh is your mouth watering too, I think this is the most heavenly thing I’ve seen all week! If this gin-soaked apple recipe is tickling your fancy take a look at the recipe here at The Craft Gin Club. 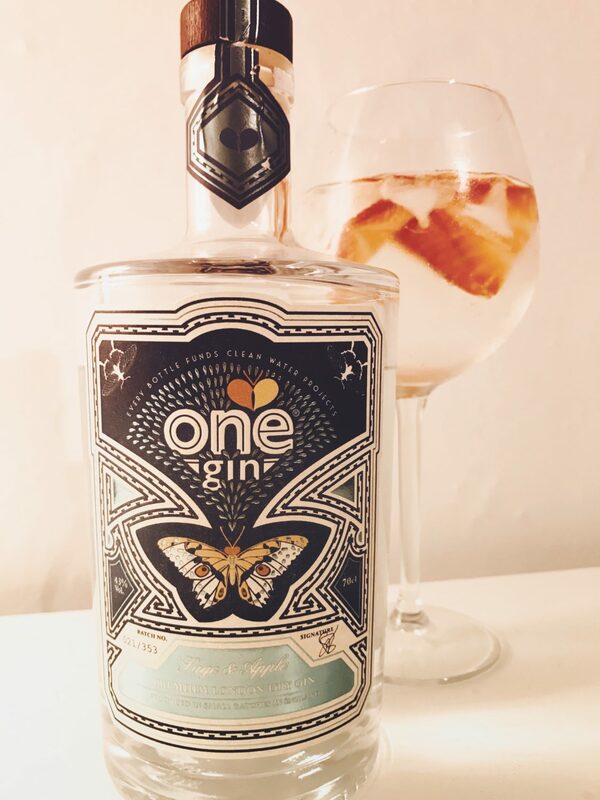 One Gin – Sage & Apple ticks quite a few boxes! But its overall taste isn’t my personal favourite so far, so score’s itself a 7 out of 10 in Rosie’s Ratings! Add the gin, apple juice, liqueur and bitters to a cocktail shaker. Add ice and shake vigorously. 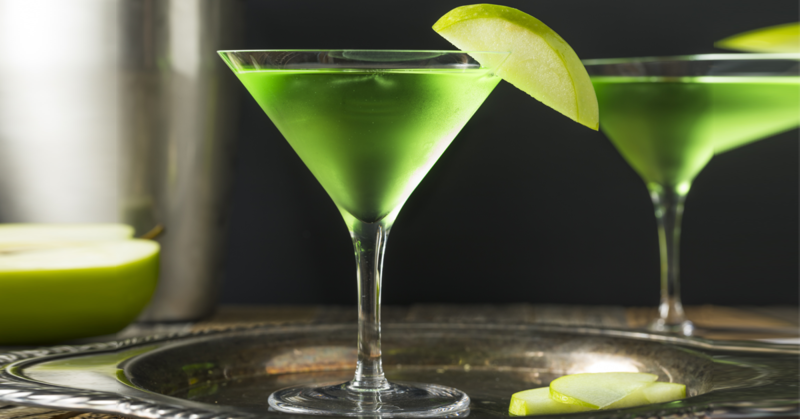 Strain into a chilled martini glass and garnish with an apple fan and sage leaves. Have you already booked to have your wedding here at Ever After? or are you thinking about taking your enquiry further? Did you know that we have beautiful pop-up lounges designed especially for either Gin & Bubbles or Whisky & Cigars? Take a look at our brochure for more information on how you can have all this on your big day!